Banjo Rally International is an annual gathering opportunity for players of all acoustic instruments. We focus on players of 4-string plectrum and tenor banjos, but all acoustic instrument musicians are welcome to attend and perform, including players of 5-string banjo, ukulele, mandolin, guitar, piano, tuba, string bass, stumpf fiddle, washboard and even a few front-line horns (clarinet, trombone and trumpet - usually played by those who also play banjo or other string instruments). The skill level of players ranges from beginner to seasoned professional. Participants range in age from 10 to 95 years of age. This hotel venue is high quality and convenient, featuring very fine convention facilities in a separate building with ample parking, great guest rooms, an excellent staff providing wonderful southern hospitality and an outstanding restaurant touted by "locals." Eureka Springs, Arkansas is a vacation destination in the beautiful Ozark Mountains with many attractions for the whole family. A trolley transportation system, with frequent service, stops at this Best Western Inn and provides inexpensive transportation to most Eureka Springs attractions Airline service and rental cars are available at the Northwest Arkansas Regional Airport in Bentonville, Arkansas, Branson, Missouri and Springfield, Missouri. Performance opportunities for players at local venues, institutions and other facilities; evening shows at the Best Western Convention Center and "jam sessions" at all hours of the day and night. 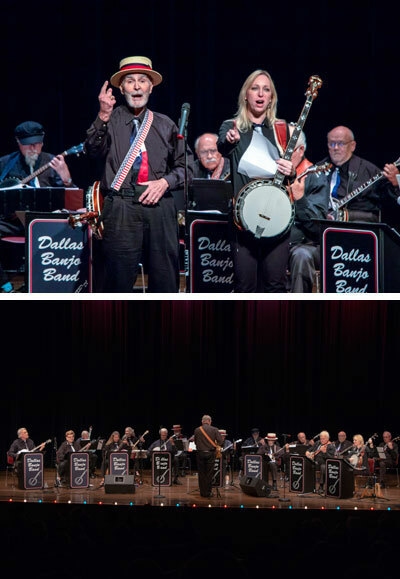 Music genres at the Banjo Rally International feature tunes from the Tin Pan Alley era, Traditional Jazz, sing-a-longs, Ragtime, Broadway Show tunes, "Swing," traditional "folk" music, Bluegrass and novelty tunes, plus clean jokes, wild stories and more. Spouses and families of players can enjoy shopping and all the other attractions in Eureka Springs and surrounding area. Spouses can partake of the Friday luncheon. Public evening shows are held on Friday and Saturday nights with quality performers for a modest admission donation. The public shows begin at 7:00 pm and last until they are over. After the evening shows, "jam sessions" usually breakout in every nook and cranny of the convention Center and evening show attendees are welcome to linger and enjoy these sessions too. On Friday evening, there is the Friday Evening Grand Banquet plus a Saturday Evening Banquet, both at the Best Western Inn's Convention Center. Banjo Rally participants are encouraged to attend the banquets as partaking of these meals provides the primary support $$$ for our use of the Convention Center facility.